J. S. Purcell began the store's long-standing existence and experience in 1914. Look how we have grown. Purcell Lumber has been OSHA SHARP (Safety & Health Achievement Recognition Program) Certified since 2007. 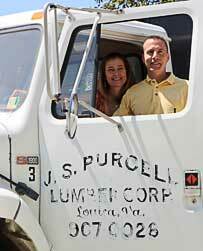 Purcell Lumber communicates with a wide variety of vendors to bring you the products you need. J.S. Purcell Lumber Corporation is a fourth-generation, family owned business which has been providing quality lumber and building materials, and friendly, knowledgeable service to Louisa County and surrounding areas since 1914. Conveniently located in the town of Louisa, Purcell Lumber offers an extensive inventory of building products necessary to complete any new construction or remodeling project for the contractor or the homeowner. Your home is one of the largest investments you will make, and we know the importance of the products that go into it. At Purcell Lumber, you'll find name brands you can trust, plus fast, reliable service. If by chance we don't stock what you need, we offer a special order program, through Do It Best Corp., featuring over 65,000 products. For 24 years we have been a member of Do It Best Corp., which is the only full service, U.S. based, American owned hardware, lumber, and building materials buying cooperative in the home improvement industry. You can shop Purcell Lumber 24 hours a day at the Do It Best site - and you'll shop with confidence. Copyright © J.S. Purcell Lumber Corporation. All Rights Reserved.